Depending on your industry, hearing conservation programs may play an integral role in your organization’s risk management strategy. Risk management is the identification, assessment and prioritization of risks and those efforts taken to minimize, monitor and control the probability and impact of losses.Everyday activities may be putting your employees at risk for irreversible noise-induced hearing loss, which may also have devastating effects for you as an employer. This could mean high insurance premiums, deductibles and an overall unsafe work environment for employees, volunteers and customers. To protect the hearing of those around you and avoid high costs, it is imperative that you become aware of the noise pollution and levels that contribute to hearing loss and take steps to either avoid or eliminate them. There are a few simple ways to tell if your work environment may be harmful to hearing. For instance, if you need to raise your voice to speak with someone who is an arm’s length away, if your ears ring or if sounds seem dull after leaving a noisy place, then you are most likely working around hazardous noise levels.Of course, you will need a professional evaluation to determine what steps need to be taken in order to make sure your work environment is safe. 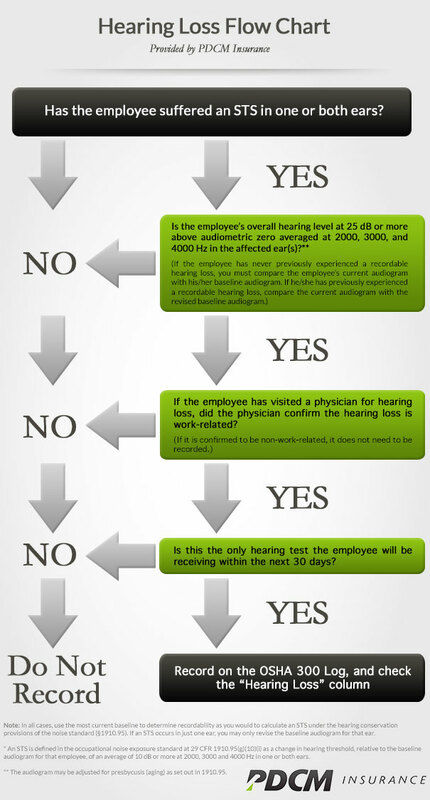 It may be necessary for your employees to wear hearing protection. This will usually mean ear muffs or plugs must be worn when employees are exposed to 85 decibels or more of noise regularly. That’s equivalent to the sound of a gunshot or a rock concert. While hearing protection is a major component in hearing conservation, it is not a perfect solution. The gear isn’t always worn properly, nor is it always 100% effective. If any employees experience ringing in their ears, feel dizzy or have trouble hearing others speak, they should schedule a hearing test and notify a supervisor.If one of your employees has suffered hearing damage, you may have to record this in accordance with OSHA compliance. Follow the flow chart below in order to determine if you should document the injury.If you have other questions about hearing conservation or other risk management strategies, contact Bill Trammell,btrammell@pdcm.com or call 319.464.0414. August 2, 2013 in Health, Hearing Conservation, Hearing Loss, Noise-induced Hearing Loss, Occupational Health, OSHA, OSHA 300, Risk Management, STS, Workplace Safety.